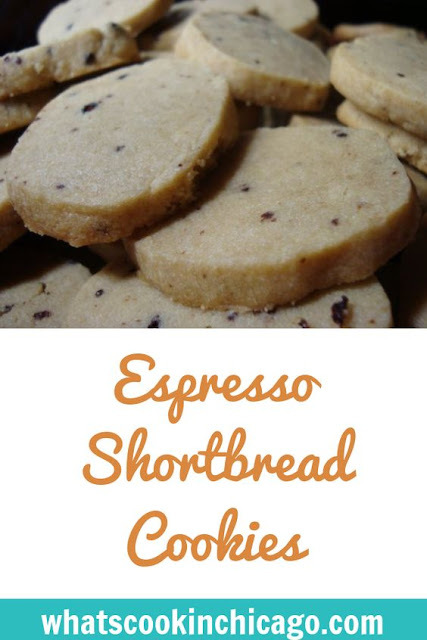 I'm a big coffee & espresso lover so I wanted to incorporate these flavors into a cookie for my cookie swap. After surfing the web, I came across Alpineberry's blog where she made these cookies. These definitely hit the spot and are perfect with a cup of coffee! 8 tablespoons (1 stick) unsalted butter, softened at room temp. Cream the butter and sugar until well blended. Mix in the dissolved espresso powder. Add the ground espresso beans, flour and salt and mix until dough comes together. Turn the dough out onto a sheet of plastic wrap. Use the plastic to help form the dough into a log about 7-inches long. Wrap in plastic and refrigerate at least 6 hours and up to 3 days. Preheat oven to 350F. Cut the chilled dough into 1/4-inch slices and arrange on parchment lined sheet pans. Bake until the tops look dry and edges just start to brown, about 12 minutes. Oh my...espresso + shortbread = utopia! I've never even thought to combine these two things...WOW. Thanks for sharing...they look wonderful! Oh yum, these look so good. I love any kind of shortbread. Mmm.